Lawngreetingcards.com values its customers, and all technically feasible steps are taken to protect their privacy. This notice summarizes Lawngreetingcards.com policies and practices regarding the treatment of nonpublic personal information that we acquire about our customers and how we use such information obtained from potential, current and former customers. Additional terms and conditions, if any, regarding the collection and use of your information may also be provided to you before you sign up for a particular service. In general, when you visit the Website and access information, you remain anonymous. Personal information from visitors to the Website is collected on a voluntary basis only and an explanation is provided as to its use at the time it is requested. This collected information is used to respond to online queries, supply requested information on Lawngreetingcards.com products and services, enable online sales, deliver ordered products, establish approved links, and for internal market analysis. Lawngreetingcards.com collects certain information from and about its users in three ways – directly from the user, from our server logs, and with cookies. When you sign up for one of our services (such as our e-mail news list) we may ask you for your name, e-mail address, and some other personal information. The more accurate information you volunteer, the better we are able to customize your website experience. This information can be received in any manner, including but not limited to in-person discussions, telephone conversations, electronic correspondence, or other written communications. Additionally, when you visit any website, including this one, you disclose certain information about yourself, such as your Internet Protocol (IP) address, the time of your visit, and the referring location (e.g., the site or page that offered a link to our page). Flamingo, like many other sites, records this basic information about visits to its site. This information helps us identify which areas of our site are of interest to our visitors. We review the IP addresses of our visitors for the purposes of system administration, to improve the content of our pages, and to verify web traffic to our site. We do not disclose any nonpublic personal information about you to anyone without your consent except as allowed or required by law. Please note, however, that the law allows us to share your financial information with others to market products or services to you. We may, in our sole discretion, report actual or perceived violations of law to law enforcement or appropriate authorities. Unfortunately, no data transmission over the Internet can be guaranteed to be 100% secure. Accordingly, despite our efforts to protect your personal information, Lawngreetingcards.com cannot ensure or warrant the security of any information you transmit to us, or to or from our online products or services. However, once we receive your transmission, we make our best effort to ensure its security on our systems. We may provide links from our site to other websites. We take steps to link only to sites that share our high standards and respect for privacy. Please note, however, that we are not responsible for the privacy standards and practices of third parties. Thus, we cannot guarantee your security or privacy when you visit any such site. Lawngreetingcards.com always strives to keep only visitor information secure against unauthorized access and use. Please notify the webmaster of this site if you discover any broken or erroneous links. If you purchase one of our products or services, we may send you a confirmation e-mail confirming your new purchase, account information and/or service. The message will be sent to the address that you supplied us and will describe ways for you to change or delete the information provided. Remember to keep the confirmation e-mail as it will also contain information that will help you in case you run into problems accessing our services. We reserve the right to choose not to deal with any person, for any reason or without a reason. Without limiting that right, we may immediately issue a warning, temporarily suspend, indefinitely suspend, or immediately or later terminate your right to access our site and refuse to provide our services to you (a) if we are unable to verify or authenticate any information you provide to us, or (b) we believe that your actions may cause legal liability for you, our other customers, distributors, parts sellers, if any, providing listings on this site, or us. Lawngreetingcards.com is committed to delivering a quality customer experience. We are constantly reviewing your feedback to improve and enhance your Lawngreetingcards.com experience. 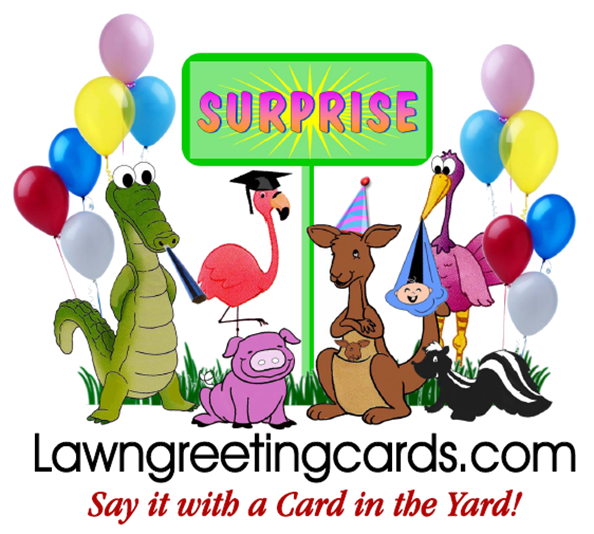 If you would like Lawngreetingcards.com to adopt additional security measures (to apply specifically to your account) in order to further safeguard from disclosure your nonpublic personal information, or if you have any questions about this policy, or just would like to tell us what you think of our site, please contact us at Surprise@lawngreetingcards.com.